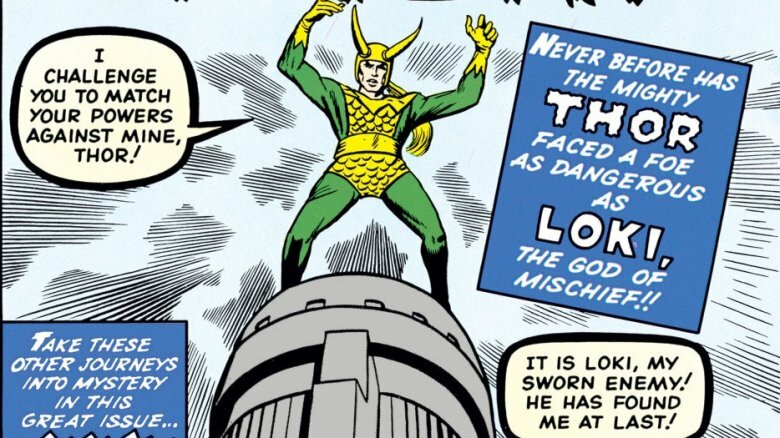 Created by Jack Kirby, Larry Lieber, and Stan Lee in the pages of 1962's Journey Into Mystery #85 (with obvious inspiration from the original Norse god in mythology), Loki is one of the most fluid characters in the Marvel universe. A villain, a hero, a man, a woman, a God of Lies, a God of Evil, a God of Stories, the king of Asgard, a Frost Giant … Loki has been many things since his first appearance, but paradoxically, he's always been true to himself. From being the unifying factor for the original Avengers to being an Avenger himself, Loki has played on all sides in Marvel with little regard for expectations or predictions. In fact, even his most consistent character trait, his hatred and jealousy of his adopted brother Thor, doesn't appear in every iteration. From turning New York City into ice cream to killing himself in a tragic double-cross, there's plenty of Loki stories you might not know. Here is the untold truth of Loki. In Journey Into Mystery #85, readers were introduced to Loki, the trickster God of Mischief after he had already been imprisoned. Loki was bound within a tree until someone was compelled to shed a tear for his imprisonment. He eventually escaped this trap by utilizing his control over the tree's limbs to drop a leaf onto the all-seeing Heimdall, which caused him to shed a tear in pain (technically due to Loki's plight). Freed, Loki immediately goes to New York, where he starts turning people into negatives and hypnotizing Thor. The God of Thunder manages to shake off the hypnotism and beat Loki by knocking him into the water, which Thor remarks is his only real weakness. If the reference to water as Loki's biggest weakness hadn't clued you in, Loki's first appearance doesn't hold a lot of similarities with his later characterization. 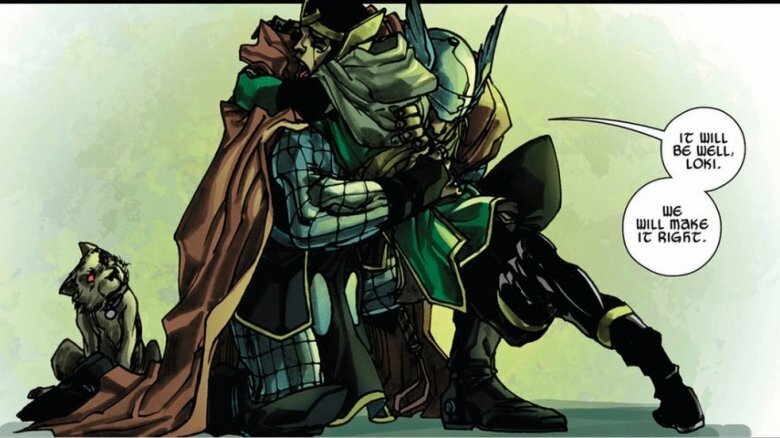 Although his hatred of Thor and love of tricks appears, the source of that enmity being their shared childhood as adopted brothers isn't mentioned at all; likewise, Loki's weakness to water isn't really referenced again later. 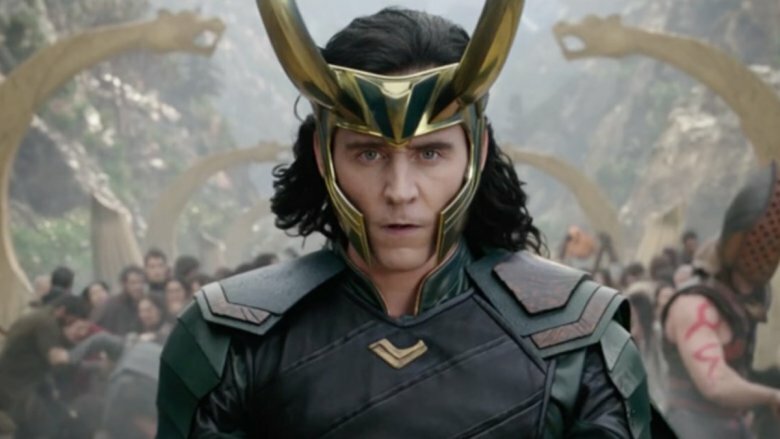 Despite all this, Loki's iconic costume and giant horns makes him a stand-out villain, and while later stories would flesh out his personality, his Kirby-designed costume needs no improvements. While his first appearance wasn't quite the fleshed-out Loki that later readers are familiar with, it didn't take long for that character to appear. By his second appearance in Journey Into Mystery #88, Loki's relationship to his adopted father Odin is established right there on the cover. Beyond his familial relationship, the comic also establishes Loki's mastery of magic and powers of transformation; while his first appearance had him utilize all manner of wacky Silver Age magic, this issue clearly showcases a Loki more familiar to contemporary audiences. 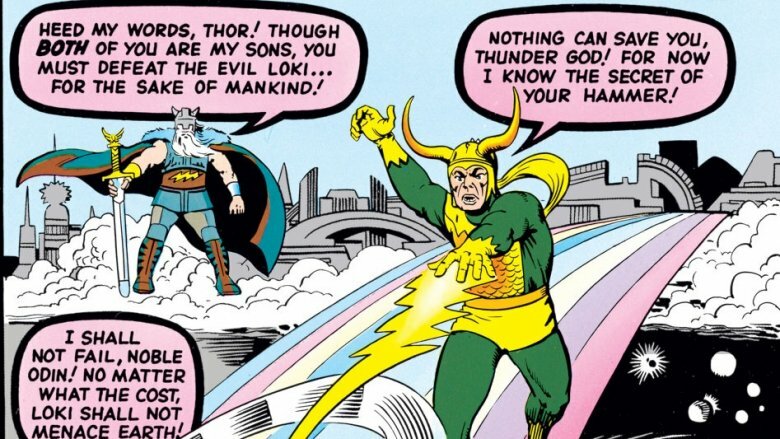 In his second appearance, Loki uses complicated plans and a penchant for disguises to prevail against Thor's single-minded pursuit of justice. The issue also established Loki's greatest weakness: his propensity to overthink and doubt himself in the middle of a carefully laid-out plan. In this case, Loki's plan was to place Mjolnir, Thor's mystic hammer, into an opaque forcefield which would eventually force Thor to return to his weaker, mortal form. The plan was surprisingly successful and, having defeated Thor, Loki goes around causing mischief on Earth. He turns New York City into ice cream and foils a Russian plot to escalate the Cold War. Unfortunately, his reign of pranks comes to an end when Thor pretends to get his powers back. Loki is so shocked that he releases the force field in order to verify that Mjolnir is still captive, allowing Thor to grab it, restore his powers, and give Loki a severe beat down. For as much as Loki's known as a villain, he's arguably contributed more to heroism in the Marvel universe than anyone else by creating the Avengers. Granted, he created them entirely by accident in one of his many, many plans to defeat his brother Thor, but actions matter more than intentions, right? In 1963's Avengers #1, Loki sends a mental projection of himself to trick people into thinking that the Hulk has become a rampaging menace. Even Rick Jones, Hulk's teenage sidekick, is tricked, and puts out a call to all available heroes to help bring the Hulk to justice. 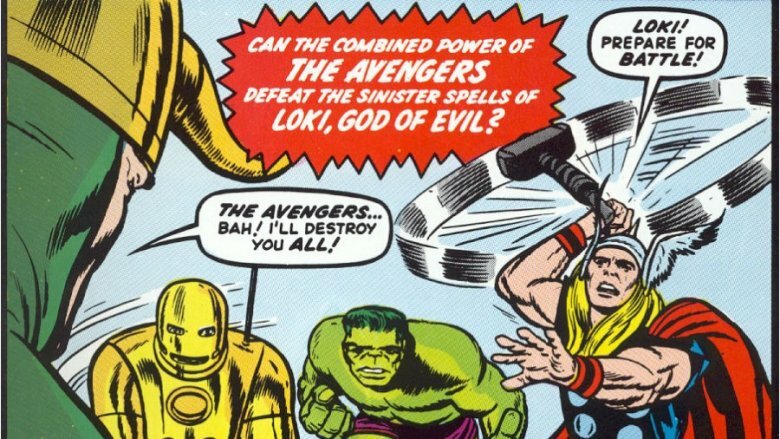 After Loki intercepts Rick's message to the Fantastic Four, only Thor, Iron Man, Ant Man, and the Wasp arrive to help. If a certain star-spangled Avenger seems missing from that list, you might recall that Captain America was still frozen in an iceberg at the time. The Avengers chase Hulk down at a circus and eventually realize that the Green Goliath isn't as mindless as they had heard, so they team up to capture Loki. While The Avengers movie ended up adding a giant alien invasion and generous helping of inspiration from The Ultimates (a contemporary reimagining of The Avengers comic series), the film stayed faithful by making Loki the first official villain of the super team. Loki even became an Avenger eventually, although that was a younger body possessed by a clone self that nearly annihilated all of reality, but we'll get to that later. Loki has always had a complicated relationship to his adopted brother Thor. While early stories positioned him as a villain eager to beat his brother simply because he wanted to, later creators would layer on a generous heaping of melodrama. Loki's hatred of his brother has stemmed from everything from jealousy of Thor's superior strength and good looks to Asgard's early ostracization of Loki to a natural predisposition towards evil inherited from his frost giant biological father Laufey. While the specifics would change from writer to writer, Loki's complicated enmity with Thor would prove fairly consistent, even when teaming up with him. 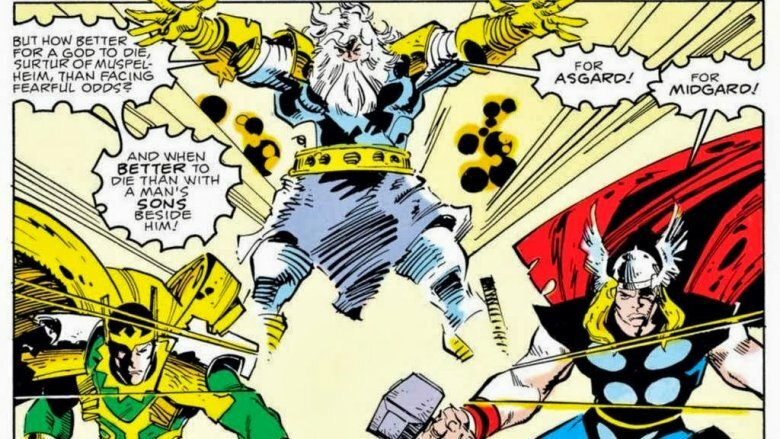 During Walter Simonson's groundbreaking 1980s run on The Mighty Thor, Loki teams up with Odin and Thor to protect Asgard against Surtur's invasion, a moment that was loosely adapted for Thor: Ragnarok. In the comics, his reason for allying with his estranged family was that Surtur wanted to destroy Asgard, while Loki wanted to rule it. Thus, Surtur had to be defeated first. Still, even in moments of occasional heroism, his long-running status as one of the classic villains of Marvel history more or less guaranteed that he would revert to mischievous, evil type. At least until Ragnarok, the literal end of the Asgardian Gods, happened in 2004. Of course, there's no real end to popular comic book characters, so Thor and Asgard returned to life in 2007 in Thor #1. In this series, Loki appeared in a female body as part of a complicated (when isn't it?) plot to use Thor to restore Asgard following Ragnarok. While Loki can change gender both in classic mythology and Marvel comics, it turned out that her new female body was the result of her stealing Sif's body as an extra insult against Thor. Later, Loki joined the supervillainous Cabal. The Cabal was a secretive group that would dictate the larger path of the world as a more villainous version of Tony Stark's previous secret superteam, the Illuminati. While the Illuminati didn't exactly make the best decisions during their brief tenure as a team, they were composed of more heroic figures than the Cabal. Whereas the Illuminati counted Doctor Strange, Black Bolt, Professor X, Iron Man, Mr. Fantastic, and Namor among their members, the Cabal included Dr. Doom, The Hood, Loki, and Norman Osborn (better known as the Green Goblin). 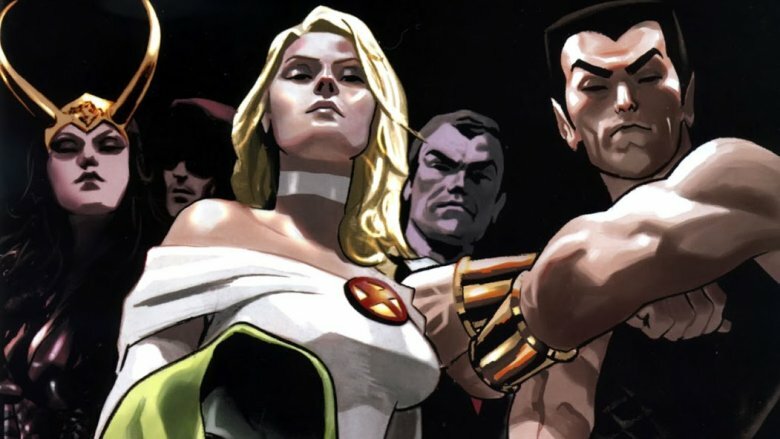 Oddly enough, Namor stuck around as part of the newly villainous secret society. As you might expect with a team comprised of three supervillains, one anti-hero, and a reformed supervillainess, the team was pretty much constantly trying to betray each other and seize control. 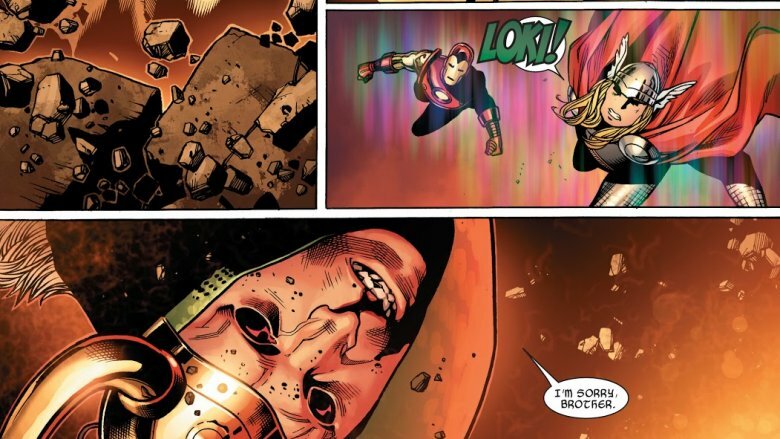 All the constant infighting and shadowy betrayals in the Cabal eventually lead to Loki manipulating Osborn into declaring war on Asgard in the 2010 comic crossover Siege. Osborn's plan depended on the Sentry, a Superman-esque superhero with an evil split personality called the Void that was fully devoted to Osborn's wishes. When Osborn was defeated by the various superheroes defending Asgard, he let the Void loose to attack indiscriminately. During the Void's killing spree, Loki realized the mistakes he'd made as a trickster, repented, and ultimately gave his life to save everyone's lives. As with almost every story involving Loki, this turned out to be a trick. Yes, he did actually get killed, but his twist was in planning for his eventual demise. Through a series of various deals with the mythological entities in the Marvel universe, Loki was able to put aside his soul for a later day, rather than getting reincarnated or sent to Valhalla. Remember that, because it's about to get very confusing. Following his death, Loki was reborn as a child who was in the sudden and unexpected position of being a hero in Asgard. Sure, everyone remembered the old Loki as a tricky, lying monster, but Kid Loki was genuinely heroic, with a pure love for his older brother Thor and a desire to redeem his past self's mistakes. Kid Loki was surprisingly effective as a superhero, utilizing his natural gifts for trickery and deceit for Asgard's benefit instead of trying to murder Thor. Ironically, this pure-hearted kid version of Loki was actually able to kill Thor, but only with Thor's implied permission in order to fulfill a prophecy that would guarantee the survival of the human race at the cost of his life (don't worry, Thor came back to life shortly after). Unfortunately, the previous Loki's soul (that had been socked away from the reincarnation cycle during Siege) had taken the form of Kid Loki's pet Magpie, Ikol. As a seemingly harmless advisor, the old Loki was able to manipulate Kid Loki into a trap where he either had to choose to let an unstoppable evil force destroy the world or let himself get replaced by his older, evil self. Kid Loki chose the latter. 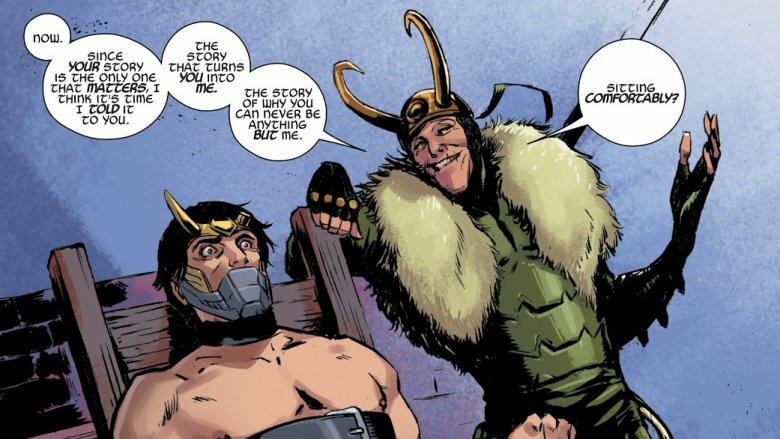 It turned out that the old Loki's plan had always been to let Kid Loki redeem himself as a pure-hearted iteration of the God of Mischief, since his previous reputation as a God of Evil had made him too predictable in the eyes of his enemies. The better Kid Loki made himself look to others, the easier it would be to manipulate them once old Loki stole his younger body for his own. 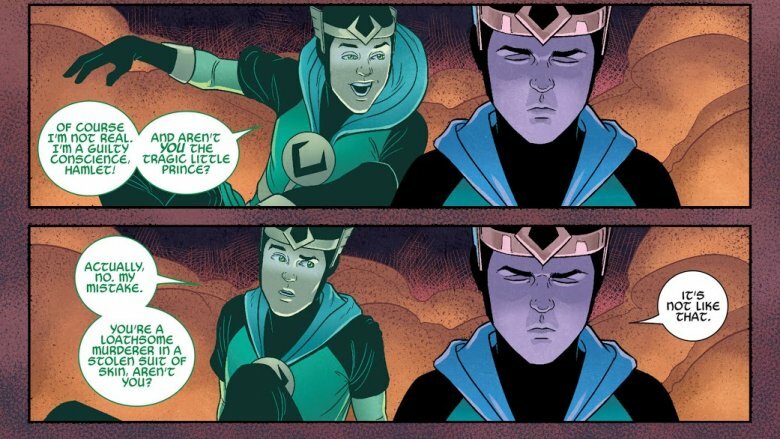 With Loki now possessing Kid Loki's body and hard-earned reputation, his next plot was to steal the reality-warping power of Wiccan, from the Young Avengers. After a series of events involving a multiversal parasite named Mother, a gathering of the Young Avengers' spurned super-powered exes, and various romantic entanglements, it turned out that Loki wasn't the same Loki he had been prior to his death-defying plot in Siege. While he'd been able to steal Kid Loki's body, an unexpected side effect was that he was then haunted by a ghostly apparition of the deed. Despite his best efforts to return to his classically evil ways, Loki had become at least somewhat burdened by a conscience. Luckily for him, this revelation happened after Wiccan had aged him up into a more magically-able teenage body that gave him a more fitting physical vessel for his cosmic ennui. Who says comic books are complicated anyway? Loki and his arch-enemy ... Loki? If the preceding paragraphs haven't made it clear, Loki might fight Thor and the Avengers from time to time, but his greatest enemy will always be himself. Most of his greatest plans are foiled by a lack of confidence or the lingering remnants of his conscience that keeps him from really committing to whatever evil plot he cooks up. 2014's Loki: Agent of Asgard turned subtext into text by starring Loki as Asgard's resident super-spy battling against his guilty past. For every successful mission he completed for Asgard, a previous legend of the evil Loki would be erased, allowing Asgard to finally accept Loki as a heroic figure rather than an agent of chaos. Of course, this was complicated somewhat by this version of Loki still being a copy of the original Loki possessing the aged-up body of Kid Loki and still burdened by the knowledge that he had murdered his former child-self in order to have a new start. To make matters even more confusing, there was another Loki involved in the story, an amoral Loki from the far-off future who wanted to assure that his younger self kept the timestream on track. This complicated knot of continuity was ultimately resolved with Loki (the Agent of Asgard one) resolving to rewrite his own title from God of Lies to God of Stories, reasoning that stories are just lies told for the benefit of others rather than oneself. This self-retcon allowed him to capture the stories of the Asgardian Gods and survive the literal end of continuity that occurred when the Secret Wars crossover ended everything. It was all very metaphorical. The last ten years of Marvel comics have been a busy time for Loki, with more starring roles in comics than he's ever had. 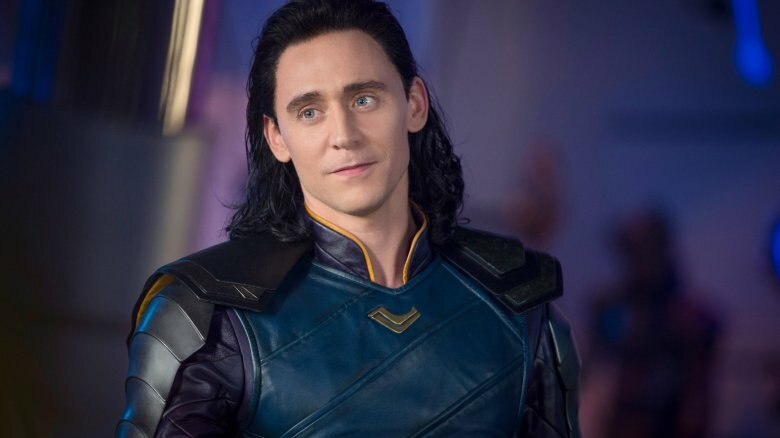 Anyone looking for simple reasons behind Loki's newfound popularity doesn't need to look farther than Tom Hiddleston's portrayal in the Thor and Avengers movies. Hiddleston imbued the character with a newfound charm and passion, giving the long-time Marvel villain a newfound fanbase. But for anyone who thinks that Hiddleston's portrayal is too much of a stretch from Jack Kirby's stone-faced Trickster God, you're in for a surprise. Even all the way back in Journey Into Mystery #85, Thor's eternal love interest Jane Foster remarks that Loki's incredibly handsome: "Loki… ummm, a lovely name. And he seems so dashing, and romantic!" Beyond giving Thor an easy reason to be jealous, there's a more fitting reason why Loki's always been hot: a good-looking liar is always easier to believe than an ugly one.